I am writing here about the rare and elusive “Trinidad 7 Pot” or “7 Pod” chile simply because nobody else has! My name is Jim Duffy of Refining Fire Chiles and I am a certified chilehead. I grow chiles both hydroponically and in pots, and I strive to grow the rarest and the hottest. My passion for chiles helps me to support underprivileged youth in eastern San Diego County. Last year I bought seeds from all over the world. The 7 Pot was one species I was after. I was rewarded this year with all these new chiles. Now I grow these rare varieties for seed stock for sale, as well as fresh chiles. My goal is to make these rare chile varieties available to my fellow chileheads here in the United States as seeds, plants and fresh chiles. Believe me, you don’t want to stay up as many nights as I did, on the web and making expensive overseas phone calls. The Trinidad 7 Pot hails from the Chaguanas region of the Island of Trinidad, which is just Northeast of Venezuela. Now this is what I have read, but it’s not the entire story. My friend Krishna Toolsie is a university professor who was raised in Trinidad. He tells me he was raised eating hot peppers, but the two superhot varieties—Trinidad 7 Pot and Trinidad Scorpion—are rarely found in the local markets. Krishna says you will find Congo Red and Yellow habanero, Scotch Bonnet and Congo Black (chocolate habanero). Other Trinidad favorites are the small Bird and long Trinidad Bird peppers. Krishna’s mom would use all these peppers in her cooking. The Congos were used in sauces and stews. The hot Bird peppers she would make into a paste with garlic, ginger and other spices and spread into the body cavity of a fish. She would then grill or fry the fish slowly and the chiles and spices would permeate the fish from the inside out to make a delicious meal. Now that Krishna had me hungry I asked him about the 7 Pot and Scorpion. He told me that these are not farmed on a large scale in Trinidad, but that many people in the rural interior grow them in their yards and small farms. He remembers his mother putting too many of them into a curry, and then nobody could eat it! I guess that’s why they call it the 7 Pot because, one pepper is rumored to be able to add heat to 7 pots of stew. Additional research led me to call the agricultural ministry of Trinidad, also know as CARDI (Caribbean Agricultural Research & Development Institute). I spoke with a man named Herman there in January of 2009. I was inquiring about Trinidad 7 Pot and Scorpion seeds. He called me crazy. He said almost nobody eats them. He said they are grown for military-grade mace and marine paint. Marine paint? “Yes, it keeps the barnacles from growing on the boats,” he said. Now I’ve learned that chiles are great for eating, have health benefits, are warfare weapons and they protect boats! If that’s the case, maybe chiles will get me another wife someday. After all, anything seems possible with chiles! 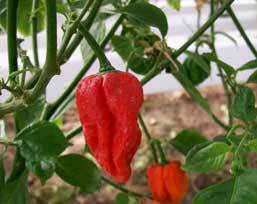 So I told Herman that we chileheads were using Naga Morich and Bhut Jolokia in food applications, so why not Scorpion and 7 Pot? At that point, Herman’s national pride kicked in. “The Trinidad chiles,” he said, “are the original superhots. Years ago people took them to India and now they claim they have the hottest chiles. We have the hottest chiles!” I guess I hit a nerve. Herman said he would get back with me about seeds, but he never did. 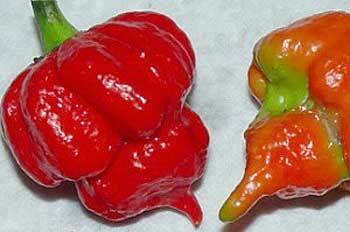 It’s interesting to note that CARDI just released information that Trinidad now will grow these superhots for the pepper industry and it is looking for buyers. 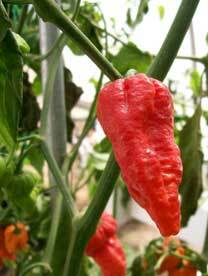 Bhut Jolokia has brought economic prosperity to areas of rural India. Perhaps now CARDI does not think crazy chileheads are so crazy after all. They now see a product to market. Wow! Did my phone call to CARDI in January stir things up? Herman was probably right. Trinidad 7 Pot probably made its way over to India many years ago. It then evolved, and somewhere along this journey it crossed with a Capsicum frutescens, as Dr. Paul Bosland discovered in genetic testing. I have grown all four of the superhots this year in isolation from one another. I have grown them both with hydroponics and in pots. All are different, but there are similarities. For example, all have a rough pimpling on the outer skin. Sometimes this is all over the skin and sometimes it is spotty. Occasionally I will find a pod that is smooth, but that is not the norm. Notice the same texture in the Bhut Jolokia. My Scorpion plants were already done for the season but here is a separate picture of them to show you the same texture. Naga Morich (middle) and Trinidad 7 Pot (right). 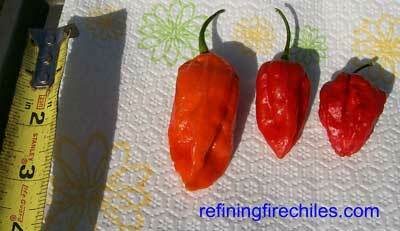 Bhut Jolokia (left), Naga Morich (middle) and 7 Pot (right). Here is a picture of all three cut open. See how the placental tissue or seed membrane is throughout the entire chile pod. Unlike other capsicum chinense, taking a bite out of the bottom of a pod to avoid the placental tissue will not help you here. 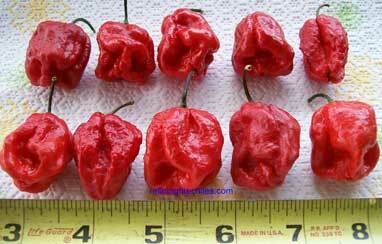 Here are a few 7 Pot photos to show the many sizes and pod shapes. A 7 Pot looking very Naga- or Bhut-shaped. A more traditional 7 Pot shape. This pod that cannot make up its mind whether it wants to be a 7 Pot or Naga! Here are pods of the Trinidad 7 Pot Jonah strain. These are larger and more round in shape. They definitely have some Congo pepper in the bloodline. Notice extreme pimpling on pod #5 in the top row. Just because your seeds come from a Jonah strain plant does not mean all the pods will be like this. I have had Naga-like pods on the Jonah plant and Jonah large pods on the naga-shaped pod plant. So in growing both together and in isolation I have found that the Trinidad 7 Pod has had a lot of cross-pollination in its history.Here are two more pics of huge Jonah pods. They are over 2 inches in diameter. On a final note, I give you my observations of heat and flavor. I have eaten small raw slivers of all four superhots a few times. Bhut Jolokia: More of an earthy flavor than other 3 superhots. I think the capsicum frutescens genetics does this. Heat level (determined by my body not HCPL testing) ranks it equal to 7 Pot or slightly above. Trinidad 7 Pot: Heat is close to Bhut but the flavor is more fruity and nutty, like other habanero types from the Caribbean. 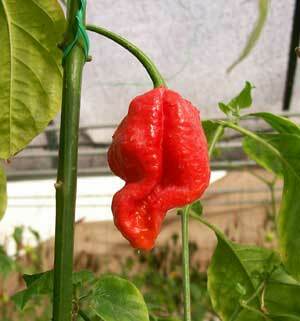 Naga Morich: I know some say this is a Bhut Jolokia. Sorry, no way. 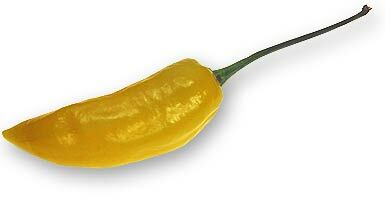 It too has the fruity flavor of typical capsicum chinense. This may be the grandchild of the 7 Pot that never crossed with a frutescens. Naga Morich pods also have a ribbing in the outer skin sometimes, like a regular 7 Pod. 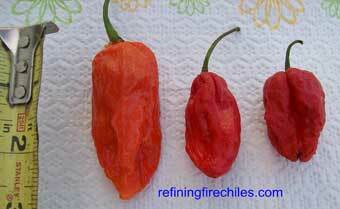 The heat hurt me more than the Bhut Jolokia! 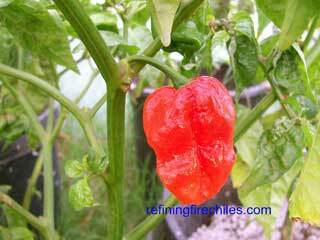 Trinidad Scorpion: Capsicum chinense species usually give me a little flavor and then build to a searing heat. Not the Scorpion. It does have a nutty flavor. I will re-enact my first taste of it: I took a small sliver and put it in my mouth. It hit me instantly with heat and my brain said SPIT IT OUT NOW!! I put my head on the kitchen counter and continued to chew as I felt the heat build. It hurt me the most. Maybe it’s hotter that the Bhut, I don’t know. Only testing in the future will tell. So now you chileheads know about the Trinidad 7 Pot or 7 Pod. Yes, there is life after Bhut Jolokia. 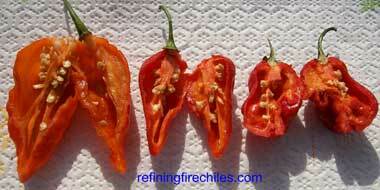 But Bhut Jolokia is what brought attention to these other superhot chiles. So I thank you, Dr. Bosland! Growing the superhots is rewarding. 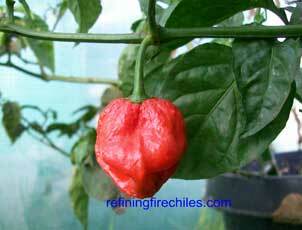 There is less occurrence of flower drop in the 7 Pot, Naga Morich and Scorpion. So if you can grow Bhuts, you can grow these. 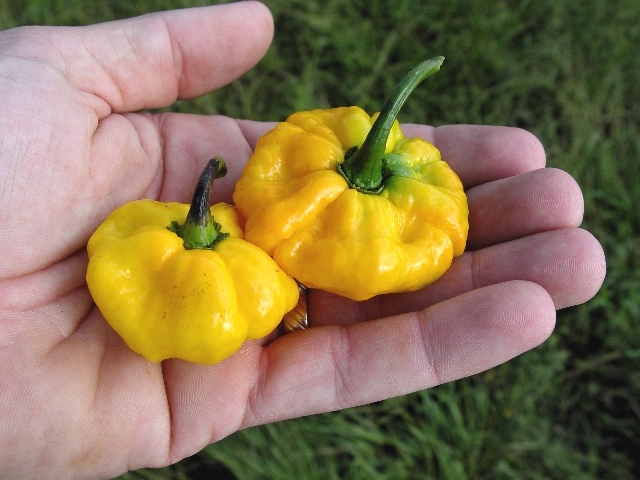 Right now my rare Yellow 7 Pots are ripening and soon I will be germinating Chocolate 7 Pot and Yellow Scorpions. Wonder what they will feel and taste like? Stay tuned—I will be back to share that with all of you!